The lotus scroll has been a popular motif in Chinese art through the centuries. Since the perfect flower emerges from mud and murky waters, the lotus was adopted as a symbol of integrity and came to be associated with the upright gentleman. The lotus is also a Buddhist symbol of purity, and its formalized overlapping petals can be seen adorning the bases of Buddhist sculptures from the sixth century onwards. 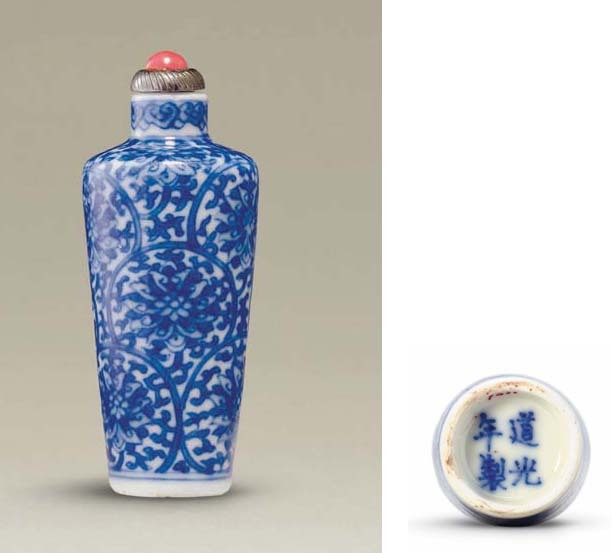 The densely-packed, formalized design of the lotus scroll on this bottle is also found on an underglaze-blue-decorated snuff bottle in the Palace Museum, illustrated in Snuff Bottles. The Complete Collection of Treasures of the Palace Museum, p. 219, no. 332. It is unusual to find a bottle of this form and design with a Daoguang reign mark.